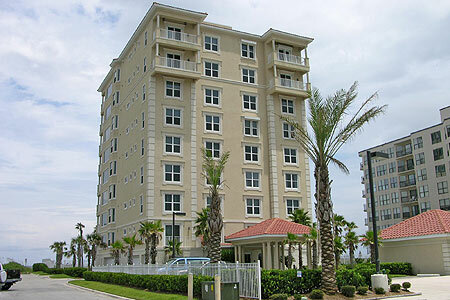 Eastwinds condominiums in Jacksonville Beach, Florida. Eastwinds is a private luxury oceanfront condominiums located on 1st Street South and 15th Avenue North in Jacksonville Beach, Florida. Eastwinds is within walking distance of the best Jacksonville Beach restaurants. Residents are close to beach festival, oceanfront park and entertainment venues. Completed in March 2002, Eastwinds features exclusive oceanfront living with 16 residences total, only two residential units per floor, private elevator access, oceanfront pool and private beach walkover, individual parking and private storage unit under the building plus one reserved surface parking. Each residence features three-bedroom, three-bath condominium with 2,350 sq.ft., 10-foot ceilings, granite kitchen countertops, spacious ocean terrace, decorator interior finishes. See floor plan.